In the third quarter of 2010, Telenor Group reported revenues of USD 4.09 billion compared to USD 3.87 billion representing an organic revenue growth of six per cent in local currency, said a statement issued by the group today. EBITDA margin stood at 33 per cent, and operating cash flow margin remained at 23 per cent. Telenor’s consolidated mobile operations added seven million subscriptions during the quarter. “Telenor Group delivered yet another strong quarter, with increased organic revenue growth, solid EBITDA margin and an operating cash flow of USD 953 million,” said Jon Fredrik Baksaas, President and CEO of Telenor Group. Telenor Pakistan performed better than we expected following the flooding which has severely affected the country. 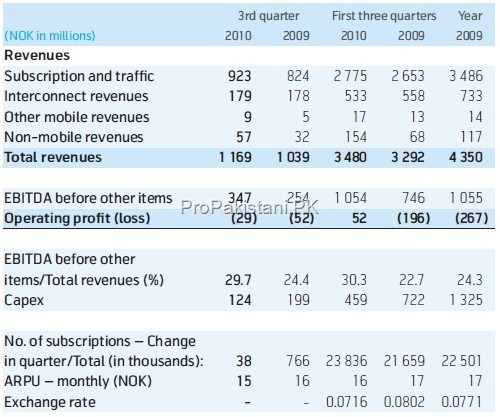 Telenor Pakistan’s revenues for the reported quarter stood at USD 199 million down from USD 210 million in 2nd quarter 2010, while 11 percent higher than the same period in previous year. Thanks to increased sales, Telenor said, company’s EBITDA margin for Pakistan stood at 29.7 percent, 5 percent higher than same period last year. Telenor Pakistan managed to cut its expenditure by 37 percent as compared to same quarter in 2009, due to focus on network capacity investments. Due to intense competition, Average Revenue Per User (ARPU) went down to PKR 220.31 as compared to PKR 235 in same period previous year. “Telenor Pakistan continues to consolidate its business growth. The previous quarter saw Pakistan facing one of the worst floods in its history. Telenor Pakistan responded with concerted efforts, becoming the first and one of the largest corporate contributors to the relief drive. someone needs to show all of this to Warid.. I think numbers are correct. Telenor is making progress.